For trucks cars buses RVs boats airplanes and off road equipment. For 12-volt DC operation only. 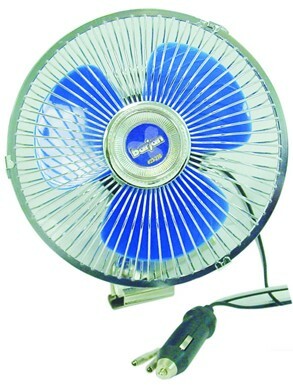 These fans permanently mount onto many surfaces with included hardware. 12 Volt White Lighted Dice. (1) 6 Red 4 AWG stranded copper power cable. (1) 6 Black 4 AWG stranded copper power cable. (1) 3 black 8 AWG copper ground cable. Ring terminals make for easy installation. This powerful vacuum is great for vehicles RVs trucks. Plugs right into cigarette lighter. Includes crevice and brush attachments.